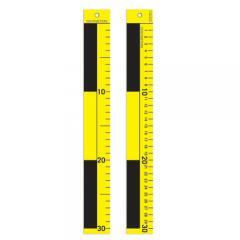 These bright yellow and black scales are 30 centimeters long with metric measurements on them. One side has the numbers printed horizontally, from left to right. The other side has the numbers printed vertically, from top to bottom. There is a small hole in the top edge so the scale can be hung on a nail or tack for vertically-oriented photographs. These scales come in a pack of five.